Notes: Based on a light novel series written by Hisashi Suzuki and illustrated by Lunalia. Our protagonist is Takeshi Nanase, a high school boy. You'd never guess that he was an "ordinary" boy, right? And no, it's actually a massive, massive surprise that his past is "somewhat" dark and depressing. Yes...you can see the paint-by-numbers kit being used to make this series from a mile away. One day he comes to school and comes across a strange girl named Mui Aiba, collapsed on the school campus and wearing a uniform he has never seen. Mui tells Takeshi that she is a magician, and she apologizes, because she has mistakenly turned Takeshi into a magician, too....somehow. What Takeshi thought was one world is actually part of two - the other is the world where magicians live. In the meantime, J.K. Rowling is calling up each and every one of her lawyers. Only joking on the last bit, but it's fun to mockingly compare this series to Harry Potter while watching it, since I found it to be boring in just about every other respect. The basic plot of the "ordinary" character finding himself or herself in some other world has been done in anime before. It has been done many, many times, and at this point one has to have an especially brilliant backstory or twist for such a series to make much of an impact. In Magical Warfare, a boring everyman, his annoying pervert best friend, and a tsundere love interest end up attending a Hogwarts-wannabe magic academy where the bad Latin makes it seem like the characters of Harry Potter speak it as well as Julius Caesar, in comparison. This happens because they gain magic powers from Mui by being caught in one of her spells and somehow no longer "fit" into the "living" world (as the human half of this multiverse is known), such that apparently their parents sign a permission slip and they end up attending said wannabe Hogwarts. Because it might as well be that....there's just about that big a deal made of the fact that his happens. I was aware that parents are often absent in anime, often to absurd extremes, but I'd think people would care more. Anyway, the rest of Magical Warfare focuses on our resident bland leads trying and mostly failing miserably to learn magic spells, which in this universe don't really seem to be useful for anything besides blasting back. One could take the fact that they struggle as a nice touch, since in many anime the characters have too easy a time learning such skills. But no, it just means that a large chunk of the first half is devoted to dull, poorly-choreographed training scenes, only for the characters to "find it within them", a la mode du shonen-style, when and only when required later on. Don't expect the characterization to make up for this, meanwhile. There's really not much to say about Takeshi except that his haircut looks vaguely like Harry Potter's, and that he and Kurumi Isoshima, the aforementioned tsundere, have apparently been pretending to be boyfriend and girlfriend in order to....keep stalkers at bay. There are so many problems with this, firstly that one would even propose this and secondly that the other person would accept this situation, and it goes just about as well as you'd expect: she actually has feelings for him, but he's an idiot and doesn't see this. Big whoop. It doesn't even ultimately succeed in its main objective, given that she ends up kidnapped and in a damsel-in-distress mode at the end, and I honestly don't think it ever would. Shouldn't one, perhaps, call the police or a school counselor before some guy from your class? And that leads me into my biggest gripe among my many gripes with this series: the source of the conflict. You see, Takeshi has a brother named Gekkou, who apparently once was obsessed with Kurumi and wasn't at all pleased with this situation. Now, at the very beginning of this series, there is a halfway decent scene in which Takeshi descends the stairs to the hateful gaze of his brother and the indifferent gaze of his single mother. "Traumatic backstory" is nothing new, but at the same time, the dark atmosphere of this scene, combined with a pretty good music cue, gave me some hope that this would amount to something substantial. Well, it turns out that Gekkou has been loathing his brother intensely and without pause, all this time, simply because it kinda looked like Takeshi was going out with a girl Gekkou likes. The moment I found this out was just about where I gave up on this show. It only gets worse from here on, sadly. The "ruined world", where the academy (the lone verdant part) is located, was made during a cataclysmic battle between evil wizards and good wizards, and the bad guys are still out there, trying to find a way back into the "living" world and break down the academy, which apparently functions as some sort of seal. Which is a great feat in urban planning, I'd say, except for the fact that it's full of incompetent novice wizards and puts them at risk in just about every possible way. So anyway, Gekkou joins our equivalent of Lord Voldemort's Death Eathers and plots to destroy the living world, simply because his brother is apparently going out with the girl he likes. I mean, I know that people do terrible things because of their twisted view of love, but this is beyond absurd. This is the kind of thing I'd expect from a farcical piece of fan fiction. And otherwise, the show really is just one big, boring mess. Both Mui and Kurumi like Takeshi, and so we have a token love triangle centered on a dull lead character who did nothing to deserve their affection. Aside from the good guys and the bad guys, there are a lot of random other wizards who just seem to be running around and make their debut apparently so that Takeshi or whonot can show off their newfound skills by defeating them. There's just about no consistency in this series, not in the art, with its bulky and ugly character design, nor in the system of magic, which, in addition to featuring terrible faux-latin, also apparently endorses using a gun as a magical weapon. I mean, that's...kind of futuristic and militaristic and all, I guess, but somehow, it takes a lot of charm out of the idea of "magic". Unless there's a good explanation given, or if they form a distinct part of one's getup (Mami from Madoka comes to mind) guns don't really belong in a show about magic. Add to this a dopey cliffhanger ending obviously written as a pitch for a second season, and we've got a real loser on our hands here. Hey, at least the theme songs are decent. 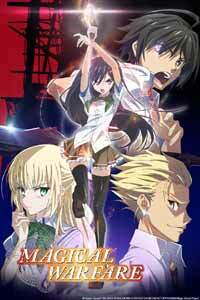 I really can't recommend Magical Warfare under any circumstance. There are worse shows, but there are also many better shows, and the laziness and incompetence on display throughout are just depressing to witness. This show started off the school year with a broken wand, and the results were about as painful to watch as the results of Ron Weasley's botched spells. Recommended Audience: There is some bloodshed, and I wouldn't show this to kids on account of the intensity.